Online shopping has nearly supplanted the print mail order business. However, catalogs are a great way to access extensive product information with beautiful visual reference. With digital catalog publishing, businesses have an opportunity to turn product information on a flat page into an experience. Combining the catalog format with the tablet is very powerful, potentially offering the best of both worlds for retailers. In this format, catalogues can be reimagined offering entirely new paradigms. 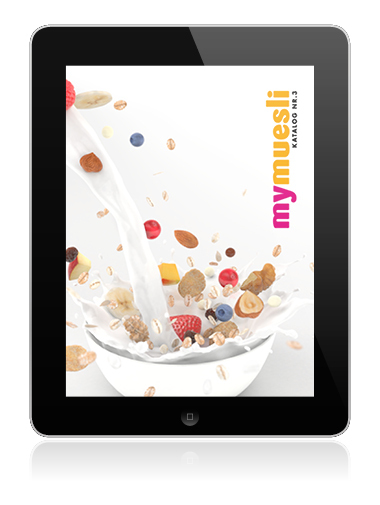 A great example of an iPad Catalog App is MyMuesli, a German brand who produces custom-mixed cereals that are sold online and then delivered to your door. Their app allows you to experience muesli in a whole new way; You can discover a new favorite cereal, view informative videos, and learn how to prepare a proper Bircher Muesli. You can also browse, mix, and shop your favorite cereal online directly from the app. With a choice of 75 different ingredients, it’s possible to create 566 quadrillion individual muesli mixes. So, forget the old fashioned bowl of Muesli- get nutty with their catalog app here.